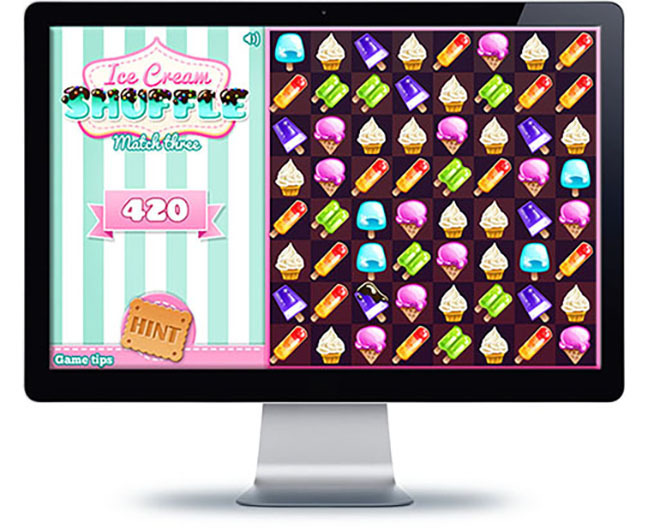 In our sweetest puzzle game, you will need to make ice cream combinations. The goal is to line up at least three of the same colored ice cream cones in a row. Simply click on two adjacent ice cream cones to swap their positions. Score more points by making longer combinations and by using the special cones to clear even more rows! The more ice creams you combine, the more points you will receive. For example, you will receive 20 points for combining 3 ice creams, 30 points for 4, and 40 for 5 or more. There are some special powers that appear when you make combinations for 4, 5, and 6 ice creams that will make it easier to eliminate all the rest. Just be careful with the time!